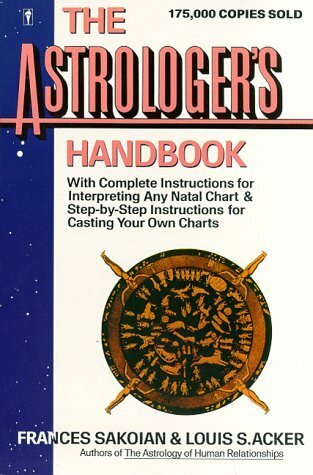 The Complete Guide to the Interpretation of Horoscopes — Precise, comprehensive, and richly detailed, The Astrologer’s Handbook moves far beyond the common 11 sun signs” to the important planetary aspects — trines, squares, oppositions, conjunctions, and sextiles — discussing their impact on the human personality and exploring their subtle but firm influence on all our lives. Although undertaken originally to meet the demands of professional astrologers, The Astrologer’s Handbook is, happily, a book that serves every reader. The authors, two respected innovators in the field, explain carefully all of the central concepts and provide easy-to-follow instructions for doing a complete interpretation — both general and specific — of any natal chart. For those who wish to actually cast their own charts, step-by-step directions are provided. Or, for those who prefer, special coupons are provided for purchasing personalized computer-gene rated horoscopes with complete tabulation of planetary aspects cross-referenced to the proper pages of this book.